Today sees the launch of our first ever crowdfunding campaign with a goal to raise £7,931 to help press play for people being held at Gatwick Immigration Removal Centre. Right now, hundreds of people held here are suffering from depression and some feel suicidal. They don’t feel like they are treated as human beings. Many have been here for months, some for years, their whole lives are on pause indefinitely. The UK is the only EU country that detains people without a legal time limit. 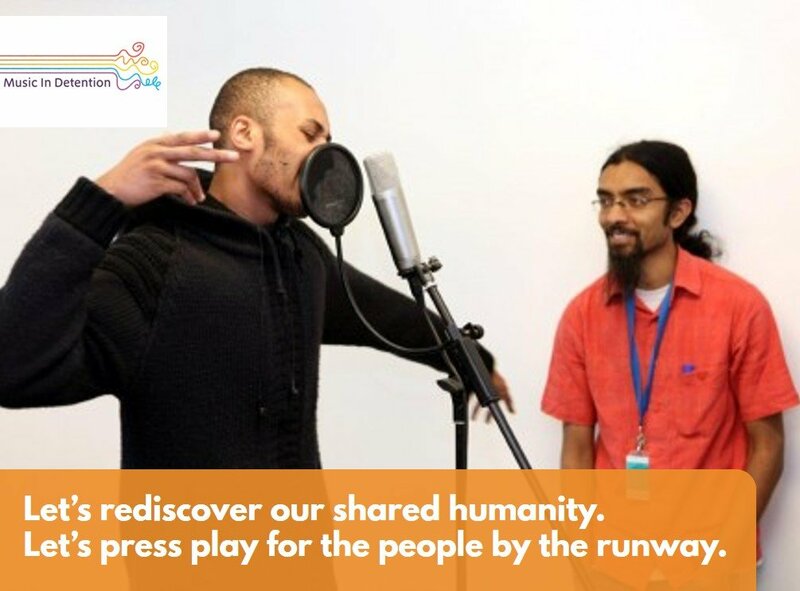 But the people held at Gatwick want to press play on their lives again, and have asked for the help of Music In Detention. With your support, they will work with two professional musicians to make a truly unique album that can help them express difficult emotions and serve as a permanent record of their individual stories. We have 35 days to raise the funds. It means we need the support of more people than have ever donated to Music In Detention. It means 198 people generously giving £40. Or 396 people giving £20. Could you please join us in pressing play for a little humanity?